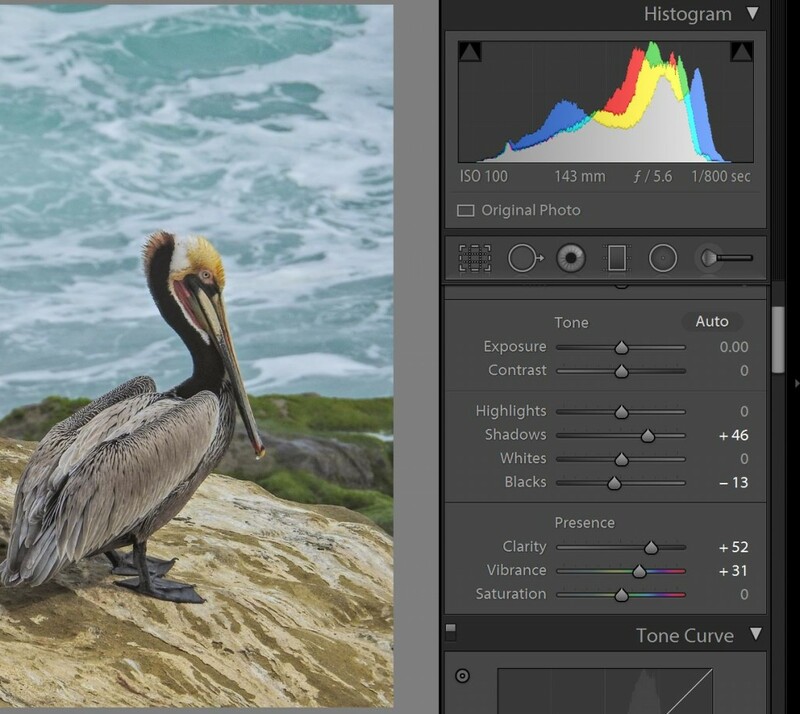 To me, Lightroom is simply intuitive…it works in a way that matches the way I think about images…so post processing is about as natural as it can get. I like the cataloging features, which help me keep track of where my images are, and easily keep my home files in sync with my social media and cloud-based archival sites. And I especially like the ability to develop and easily apply presets…saved processing settings across the whole spectrum of possible edits…to a single image, or to a whole set. Then too, Lightroom has at least semi-embraced the world of tablet computing. The Edit module has a tablet interface that makes excellent use of the Surface Pro touch-screen to further ease the processing chores. Finally, the edits in Lightroom are the smoothest and least destructive of any program I have used…and that is saying a lot, since I shoot only jpeg, and do all my processing on jpegs. All in all I can’t see myself giving up Lightroom any time soon. I even bought into the Adobe subscription model, much as it pained me, so that I can continue to use the latest features of the program. In this piece, I am going to walk you through the creation of a preset. The first thing I do when I get a new camera is create a small set of presets for different processing needs. Generally I do one for 1) “standard images”…images that just require a bit of sharpening and enhancement to realize the full potential of the file. 2) HDR images…images which are produced by the camera’s built in HDR mode, or in some cases by the camera’s Landscape mode. I use the camera’s HDR or Landscape modes for…well, as you might expect…landscapes…especially dramatic landscapes with lots of light and shadow and interesting cloud effects. These images generally require a bit more lift to reach full potential. And then maybe 3) an HDR preset with a bit of added umph, and some extra brightness, for those cases were the scene was really beyond the ability of the camera to catch it. I might also develop a preset specifically for macro shots for some cameras, if one of the others does not already cover those images. So, lets look at a “standard image” and its preset. This image, like most well exposed digital images, only requires some added pop and sharpening to go from a good image to a really satisfying one. I begin my opening the image in the Develop module in Lightroom. Near the top of the editing controls are some basic settings. I intentionally underexpose my digital images by 1/3 EV by setting the exposure compensation to -1/3 on the camera. This maintains more of the highlight information in the original file. Therefore most of my images need a little boost in the brightness of the shadows. If you are doing this at home, just grab the Shadows slider and slide it to the right until you get the effect you want. Watch the image. Note what the slider does as you move it. Move it just enough to the right to achieve the degree of shadow lightening that you like. Images from the Nikon Point and Shoot superzooms that I use are just a bit flat out of the camera. They lack pop. I could add pop by adjusting the contrast, but that would also whiten the whites and lights in the image and burn out whatever detail is there. Instead, I use the Blacks slider to make the blacks (and very dark colors) blacker. Slide the Blacks slider to the left until you get the effect you want. Clarity is something like “local contrast”…it effects the way colors grade into one another when they are next to each other. Move the Clarity slider to the right to add Clarity until you get the effect you want. This also adds pop to the image. Vibrance controls the saturation of the weakest colors in your image…and only the weakest. Moving it to the right adds vividness to the image. Be careful. Too much added Vibrance will make the bright colors “block up”…or lose detail and produce an unnatural, poster-like effect. Add just a bit of Vibrance. Generally you do not want to, or need to, touch the other controls in this section. Remember you are creating a preset that will be applied to many images as you process. You can go back to the develop module after applying the preset and tweak other settings as needed…but you just want this preset of do the basic work. 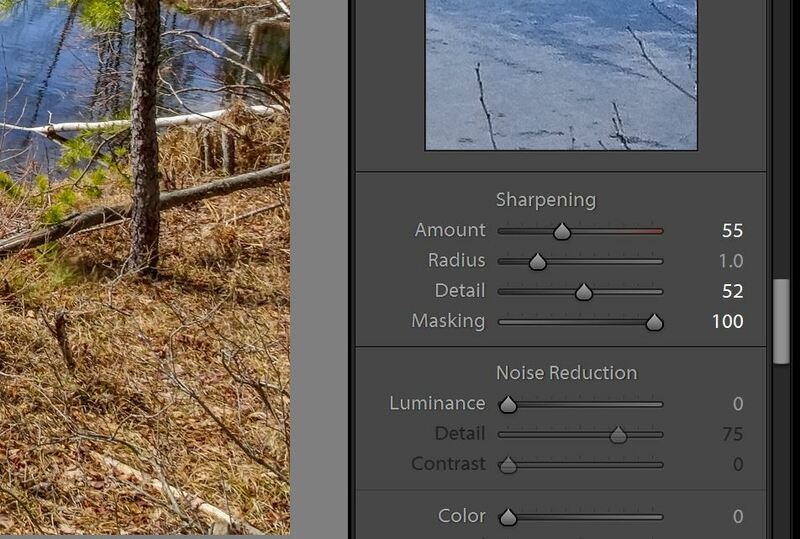 Next, for most images I use the existing Sharpen Scenic preset built into Lightroom. You can find it in the develop module in the left hand panel. When I apply it, it sets the sharpening controls as you see them here. You can achieve the same thing by sliding the controls to these positions yourself. All digital images require some sharpening. I actually turn down in-camera sharpening when I can, because generally sharpening in post does less damage to other parts of the image than the camera does. I do not recommend much more aggressive sharpening settings than you see here. You will not like the effects on overall image quality. 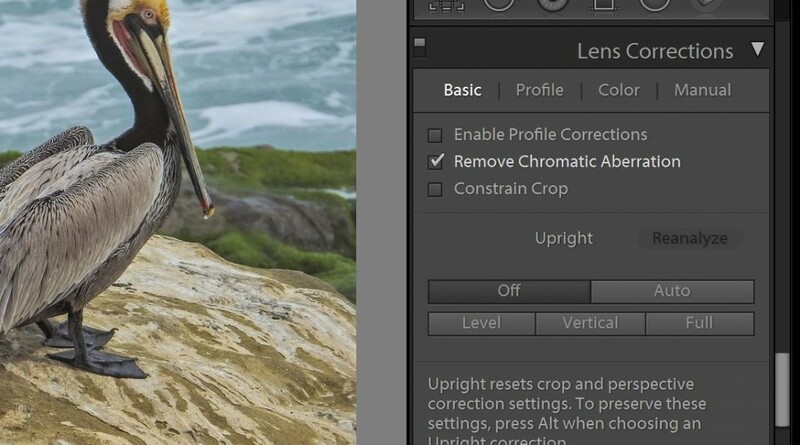 Just as all digital images can benefit from some sharpening, most digital images will benefit from Lightroom’s “Chromatic Aberration” filter. Chromatic Aberration is the little (or not so little) lines of green or pink (or blue and yellow) light that appear at the edges of things in your image, especially near the outer edges of the image, especially when the edge is against a white, light, or black background. It is a lens fault. 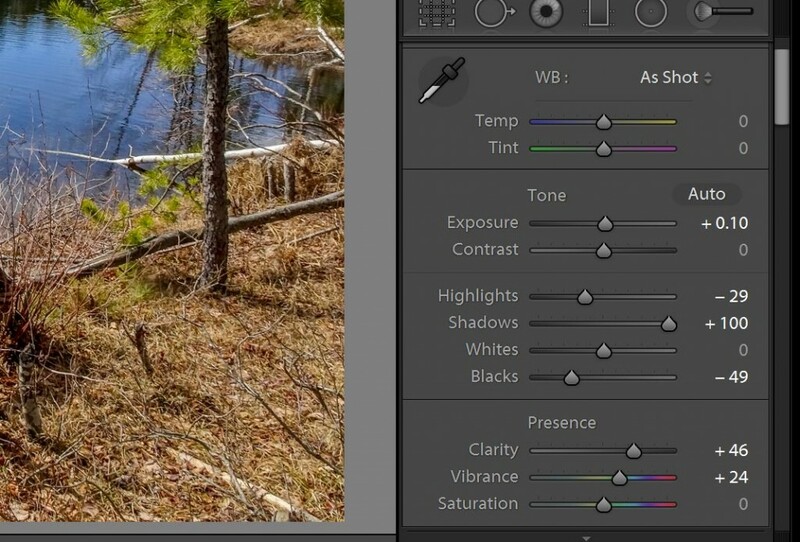 Many cameras will already process it out when they create the jpeg…but turning on Lightroom’s filter can only help. 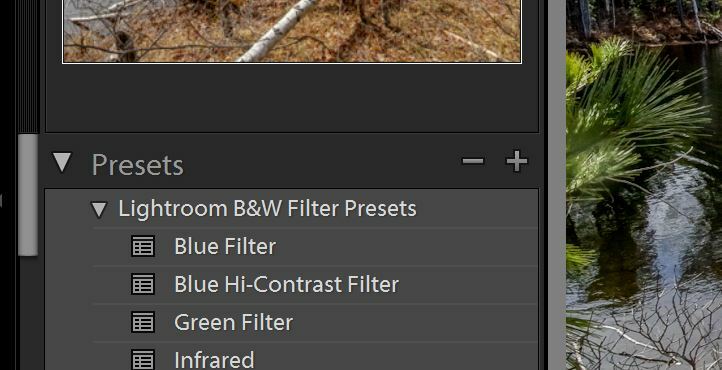 Finally, the latest version of Lightroom has a new filter called Dehaze. It works something like the Clarity filter above, but with the emphasis on the blue end of the spectrum. Blue light is the most likely to get scattered over the surface of the image, both from atmospheric haze, and from light scatter inside the lens of the camera. Therefore a filter that looks for the scattered blue light and removes it from the image improves both the clarity and the vividness of the image. Be careful here, as too much Dehaze will darken your whole image, and turn the blues toward black. Here is a comparison of the edited (right) and unedited images. The difference is not dramatic, but it is enough to turn an okay image into one that is more satisfying. Here is the edited image at a larger size. Compare to the unedited image above. To create your first preset, open the best of the files you just edited in the Develop module. 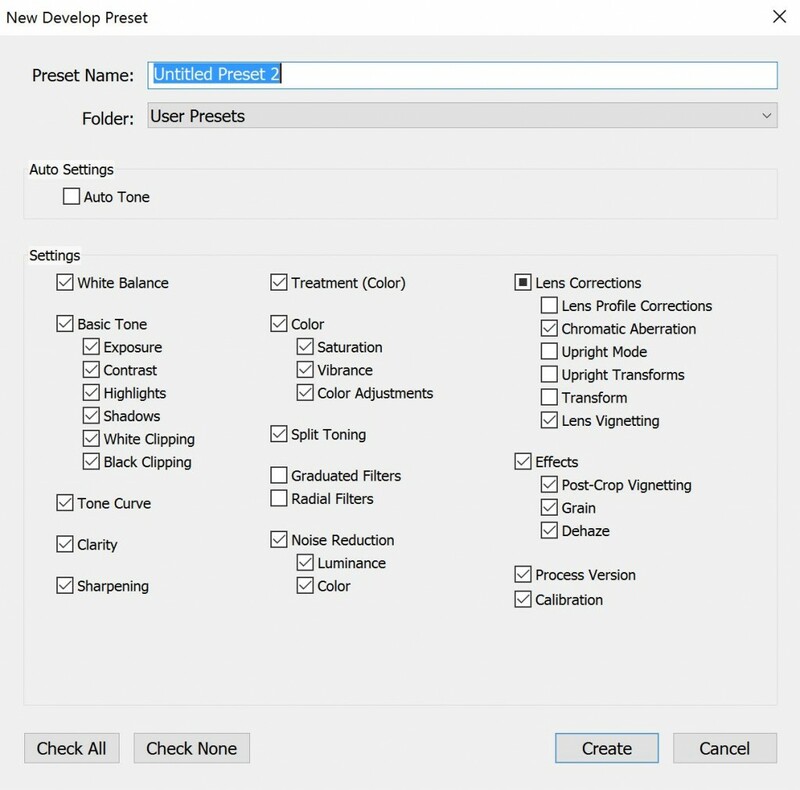 Look for the Presets section on the left hand develop panel. Click the little plus sign next to the Presets title. This will open a window displaying all your current settings, and providing a field at the top to name the preset. Name it “Standard” or give it the name of the camera or whatever. The settings you have changed, and the settings that are necessary for every image, will already be checked in the list of settings. Just name your preset and click “Create”. It will be saved to your “user presets” folder, where Lightroom can find it when needed. Now that you have a preset created, you can apply it easily to either single files or multiple files. The following illustrations show the difference in settings between my “standard” Nikon preset, and my Sony HDR preset. The Sony in-camera HDR files can handle some extra pop and some extra sharpening. I have applied a sharpening mask to keep the HDR artifacts from showing up in open sky. Chromatic Aberration and Dehaze settings are the same as for my basic Nikon preset. 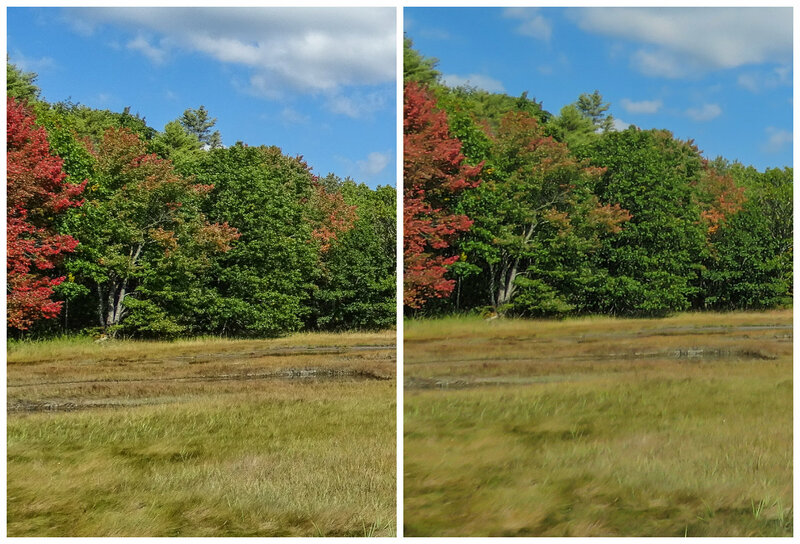 Here is a comparison shot of the unedited HDR file and the file with the Sony HDR preset applied. Note that the difference here is not so subtle. The Camera produced a file using the HDR technique that has enough information in it so that it can be processed into a very satisfying extended range image. And the image was processed with a single click in Lightroom! Again, you don’t need a lot of presets. 2-3 per camera you use. Once a preset is applied, if you still think you can improve the image using other editing controls in Lightroom, you can always open the Develop Module and make whatever changes you like. The great thing about Lightroom is that any changes you make will be added to the changes, or override the changes, you originally made with the preset…and any changes you make with either can undone instantly. The program does not actually make the changes you see on the monitor until you save or share the image. Your file is always preserved as the digital negative and you can start over with your edits any time you want. The major complaint I hear about Lightroom is that it is too hard. It is actually the easiest program for image editing I have every used. 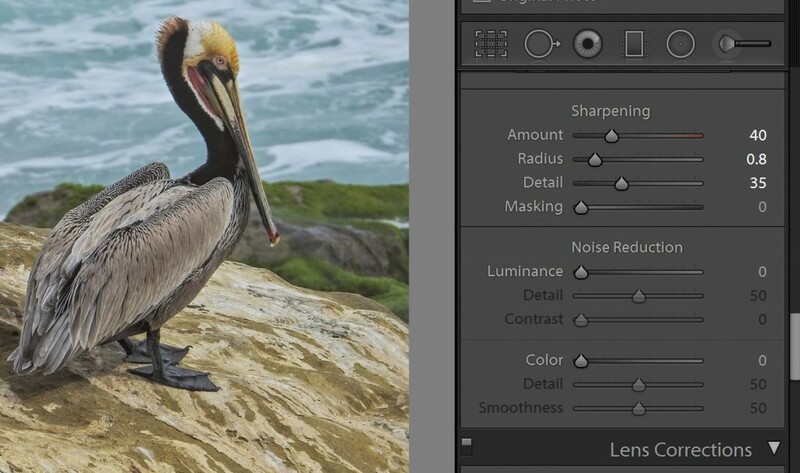 I hope this article gives you the courage to dig out your copy, and to give it another try…or at least encourages you to create your first presets to release the power of Lightroom. Honestly, I have never been anywhere as photographically engaging as Tranquilo Bay Lodge on Bastimentos Island in the Bocas del Toro archipelago on the Caribbean side of northern Panama. The lodge itself, situated 35 minutes by boat from the the Bocas Town airport on Colon Island, is surrounded by Caribbean rain-forest with all the usual suspects: Boat-billed Flycatchers, bright Blue Dacnis, Manakins, Tityras, Honeycreepers, Sloths, Bird-eating Tree Snakes and White-faced Capuchin Monkeys to name a few…and there are a host of unique habitats, from rocky islands with colonies of nesting sea-birds (Frigate Birds, Boobies, and Red-billed Tropicbirds), to tiny red and blue and yellow and black Poison Dart frog infested lowland jungle, to Coco plantations with Trogons and Toucans and Howler Monkeys, bigger green and black Poison Dart Frogs and Yellow-headed Geckos (and Purple-throated Fruit Crows! ), to the mainland with abandoned banana canals threading though forest where Blue Morpho butterflies float, and high mountain passes with cloud forest: orchids, Motmots, White Hawks, a host of Plumbeous Kites, Squirrel Cuckoos, Lineated Woodpeckers, and more Toucans and sloths. There can not be many places in the world to equal the easy accessible tropical variety of Tranquilo Bay Lodge. I was there for an atypically rainy week in April, and, despite the rain, it was one of the best weeks of photography I have ever experienced. As noted before (P&S in the Tropics) the tropics might just be the ultimate test for any P&S camera and many P&S photographers. I had a new camera for Tranquilo Bay, the Nikon P900 I reviewed here, and I am happy to say that it was more than up to the challenge. I packed my Canon SX50HS for back-up, but it never left my suitcase. Based on my previous experience in the tropics of Honduras, I also packed my super-light-weight MeFoto Roadmate carbon fiber travel tripod…and that too never made it out of the suitcase. I shot, and got satisfying images of everything from flash aided macros of Poison Dart frogs, to Canopy Tower panoramas, to dark under-canopy lecking Manakins, to frame filling Blue Dacnis and Shiny Honeycreepers from the Lodge deck, to distant Toucans and Snowy Cotingas from moving boats…all of it hand held with the P900. 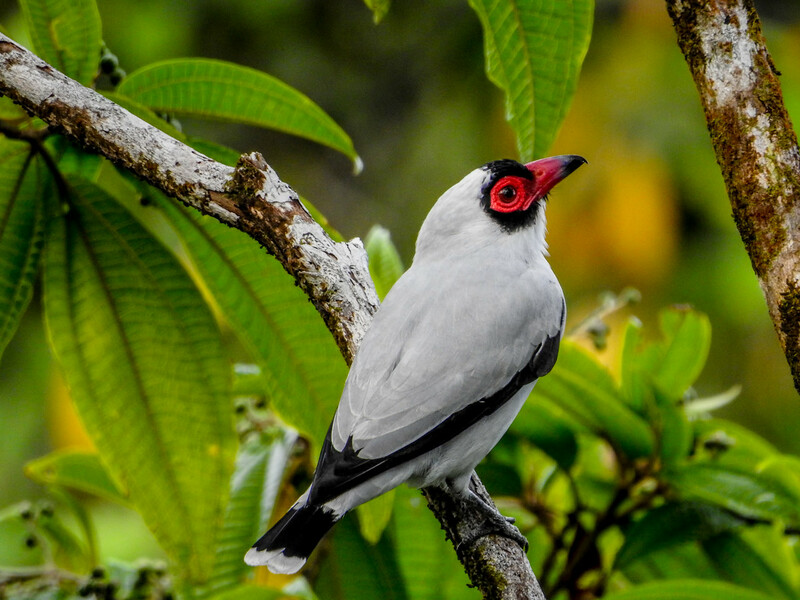 As far as I am concerned, no camera could have done a better job in the tropics than the P900 did, and few could even have come close. Impressive. I used Sports Mode a lot in Panama. In the low light under the canopy and on rainy days it seemed to lock on focus more quickly and more accurately than standard modes. The downside is that it is fixed to High Speed Continuous shooting and I sometimes did not want to shoot 7 frames and wait for the buffer to clear before I could take another burst. For those situations I used my custom bird and wildlife mode: manual focus square set to normal (it seems faster than small at higher magnifications where there might not be much in the smaller square), Low Speed Continuous, Low Noise Reduction, Standard Picture Control, -1/3 EV exposure compensation, Auto ISO and Color Balance. Neither mode gave me shutter speeds in the dim light that I was comfortable with…but…and this is huge!…the 5 Stop Vibration Reduction image stabilization in the Nikon enabled me to shoot satisfying images down to 1/125 on a regular basis…and I even got some excellent results at 1/30 of a second when the ISO went up to 1600. Once I saw those on my Surface Pro screen in my daily review of images, I gave up worrying about shutter speed and just let the camera do its thing! The alternative would have been going to Shutter Preferred, but that would have driven the ISO up even higher, or resulted in underexposed images like the ones I brought back from Honduras. All in all I am more than pleased with the P900’s performance in auto modes. I am convinced I could not have gotten the images I did with any other camera (especially without one of those projection fill flashes the pros use). I will post a few galleries of images from various locations, or you can see the whole set at my WideEyedInWonder site. Here. These shots are all from the deck surrounding the community/dining room at the Lodge. We hiked out, one afternoon, to see a Bird-eating Tree Snake the workers had found on the edge of the cleared ground at the Lodge. While we were out, and already wet, we hiked on into the rain-forest to see Golden-collared Manakins on the leck under deep canopy (in the rain). The Manakins are miraculous shots, considering the conditions. Hand held. And great birds. The males clear a lecking pad about 2.5 feet square, removing all vegetation. There they put on their wing-popping display to try to attract females. Frogs and lizards (spiders too) from Popo Island. Also some Keel-billed and Black-mandibled Toucans and a Snowy Cotinga photographed from the boat on the way. We got to the Green Acres Chocolate Farm late, due to rain in the morning, so many of the birds had already moved in deeper and up higher for the day. Still it was a great location. I am certain it is spectacular on a nice clear morning. One of the best things about Tranquilo Bay is that the islands are off-shore from the highest point in the mountains that make up the backbone of Central America…and there is a good road right up and over a 4000 foot pass, which takes you well into the Cloud Forest, and then on down the Pacific Slope. It is a 40 minute boat ride to the mainland dock, and then you can be in Cloud Forest via van in less than an hour…or you could be if you could resist stopping to bird along the way 🙂 But then you would miss the spot where the Boat-billed Herons nest behind the gas station, or the nesting Plumbeous Kites, the Sloths and Toucans. We got rained out on the Caribbean side of the pass, but on a normal day, we could have birded both slopes of the mountains for a wide variety of species. 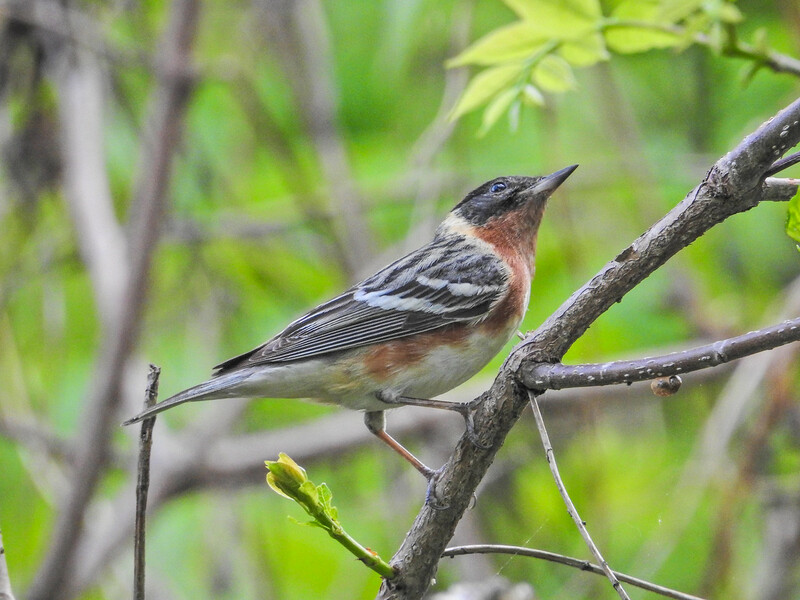 As it was we found a number of high altitude species, as well as some North American Warbler passing through. Our final trip out from the Lodge was to the old Synder Canal…a banana canal built by the United Fruit Company to open a new area to banana cultivation in late 1800/early 1900s. It only operated for 4 or 5 years, before an expanding rail system made it obsolete and it was abandoned. 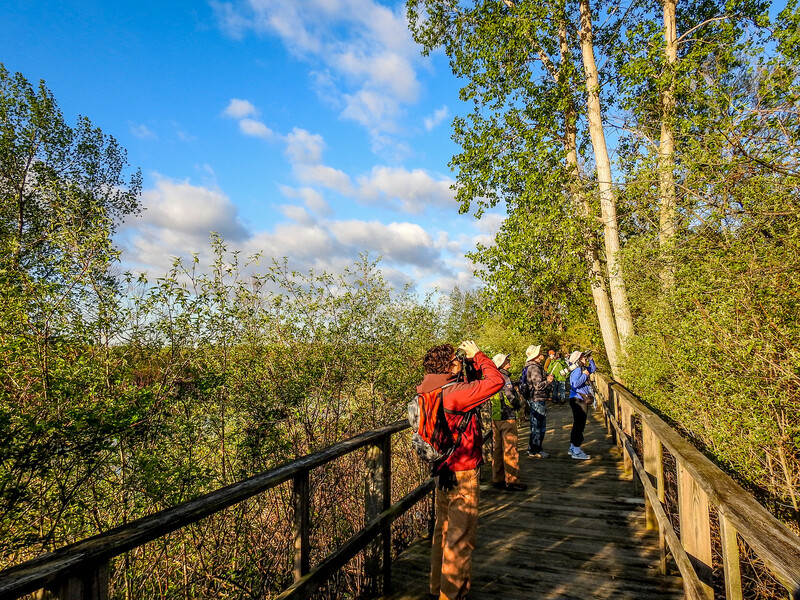 Today, it is kept open (mostly open) by the local people who use it to reach dwellings along its shore, and by a few tour operators who take folks through for the unique views of wildlife and forest. It runs though a Biological Reserve for much of its length. 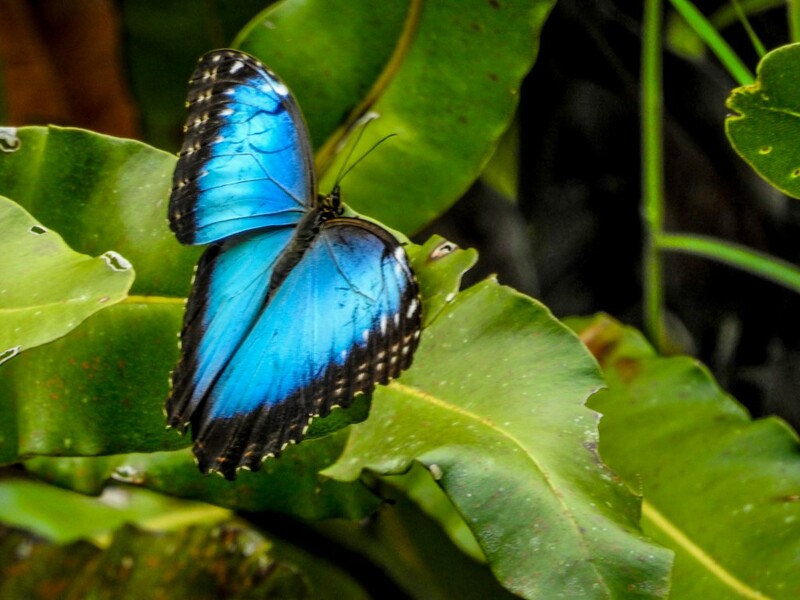 This will always be a memorable trip for me, since I saw, and photographed, my first perched Blue Morpho Butterfly with its wings open. They are common enough in the tropics, starting in Mexico and running south into South America. They float down forest trails and water courses at eye-level, their intense blue color and lazy flight making them unmistakable. They never perch with open wings! But one did along the Snyder Canal the day we visited. This is a 180 dregree panorama from the top of the tower. There is 360 degree pano in the gallery. 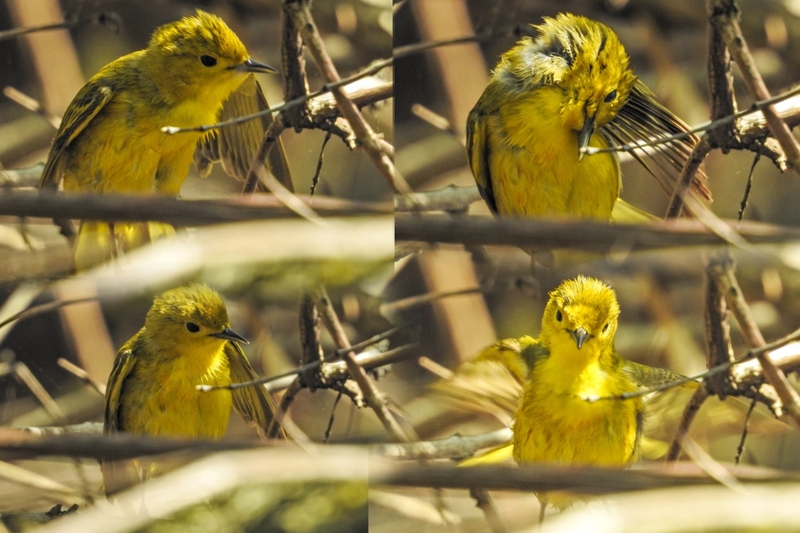 All in all, the performance of the Nikon P900 under tropical conditions was pretty near awesome! If you are not convinced by now, I can only say again that Tranquilo Bay and the surrounding area in Bocas del Toro Panama is one of the best places for bird and wildlife photography that I can imagine…and I was not there on a good week. I am planning, if I can round up a group of six eager Point and Shoot Nature Photographers who want to join me, to return to Tranquilo Bay in mid-October (Columbus Day week). The weather is promised to be more cooperative, the North American migrants are moving through on their way south keeping things stirred up. Seas should be calm. And Tranquilo Bay should be at its best. Want to come. Contact me at lightshedder@gmail.com. Even if you don’t join me…Tranquilo Bay should be on any photographer’s bucket list! When the Canon SX50HS came out, two years ago next month, it was a significant upgrade from the SX40HS, which was already a great Point and Shoot superzoom for wildlife, macro, and landscape photography. 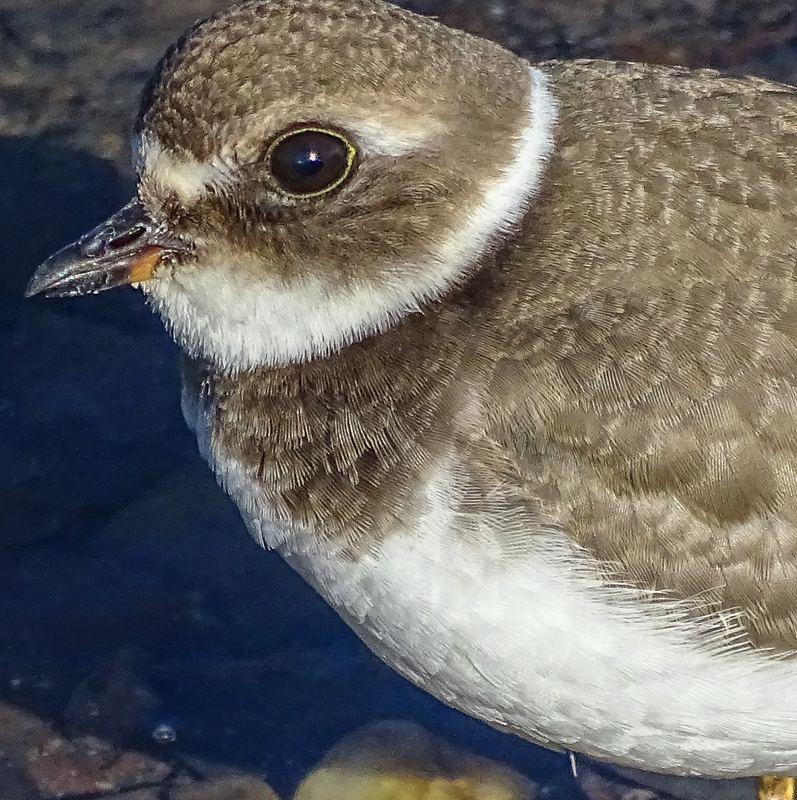 The SX40HS had impressive image quality, a long zoom with enough reach for even small birds and bugs, great optical image stabilization, and a wonderful macro ability both at wide angle and at full telephoto. The SX50HS added a 50x zoom reaching 1200mm equivalent (2400mm with a very usable 2x digital tel-converter), fast precise focus, faster continuous shooting, a great Sports Mode for birds in flight, and, for those who wanted it, RAW. It quickly became, if you measure such things by the number of users and the chatter on the forums, the de facto standard for P&Ss for nature photography. However, in the two years since its introduction a whole new group of features began to appear in competing models and in P&Ss in general. Wifi connectivity, GPS tagging, sweep panorama (see the post), in-camera HDR that does not require a tripod (post)…not to mention ever increasing pixel counts. Unfortunately none of the newer models seemed able to match the image quality of the SX50HS, and, honestly, for the P&S nature photographer, it is all about image quality…or at least it is about image quality first. When last October rolled around, a lot of P&S nature photographers were disappointed that Canon did not update the SX50HS. Rumors came and went, and the fate of the SX60HS became a hot topic on the forums. It came up every time there was any kind of opportunity for an introduction from Canon all through 2014. A few months ago I decided not to wait any longer, and purchased the Sony HX400V. It has all the modern features, a 20mp sensor, and, to my eye, image quality as good as the SX50HS…better in some situations…different certainly, but still very satisfying. This month, of course, Canon finally introduced the SX60HS. It is not supposed to ship until October 20th, but I was able to get one direct from Canon this past week. 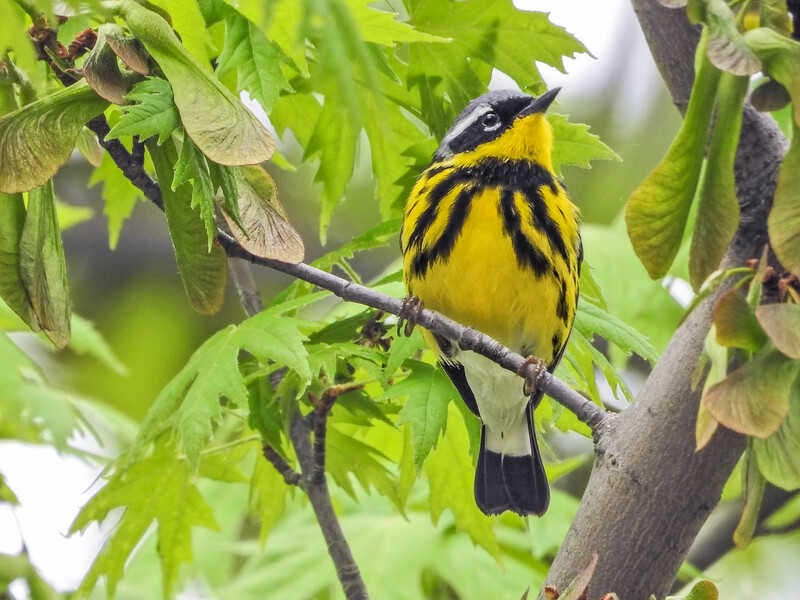 In many ways, it is everything a P&S nature photographer could have hoped for in an upgrade. The Eye-level Electronic View Finder has been improved dramatically! It is bright, and detailed…the best I have seen in a P&S camera. The LCD panel is also high resolution and very easy to use. The zoom is slightly longer (65x or 21mm – 1365mm, and still with usable 1.6x and 2x digital tel-converters to get you out to 2730mm when needed). The pixel count has been increased to 16mp, considerably less than the Sony’s 20, but considerably more than the SX50HS’ 12mp. Continuous shooting mode has been revised to 6.4 frames per second with viewfinder refresh between frames (the blacked-out view during high speed shooting was a major criticism of the SX50HS), 4.5 frames per second with auto-focus between frames. Contrast this with the Sony HX400V which only manages 2 frames per second with focus (or without focus…though it does have a 10 fps fast mode, see below), buffers all the images, and takes a much longer time to process and write the images to the card. Macro mode has been extended so that you can still focus to 0 inches (touching the front lens element) at wide angle, but now focus to 1.1 inches all the way out to 200mm equivalent! Wonderful! There is built in, no tripod needed, HDR. Wi-fi connectivity is built in and apps are available for Apple and Windows laptops, tablets, and phones. They also claim faster focus, but, personally, I don’t see a lot of difference between this and the SX50HS. Unfortunately, at least in my early sample, Canon has not managed to maintain quite the same level of image quality from this 16mp sensor as they got from the 12mp sensor in the SX50HS. In fact, in every test I have tried, straight out of the camera, the SX50HS shows more detail and slightly better color than the SX60HS, and when looking for fine detail, the SX60HS comes no where near the Sony HX400V. 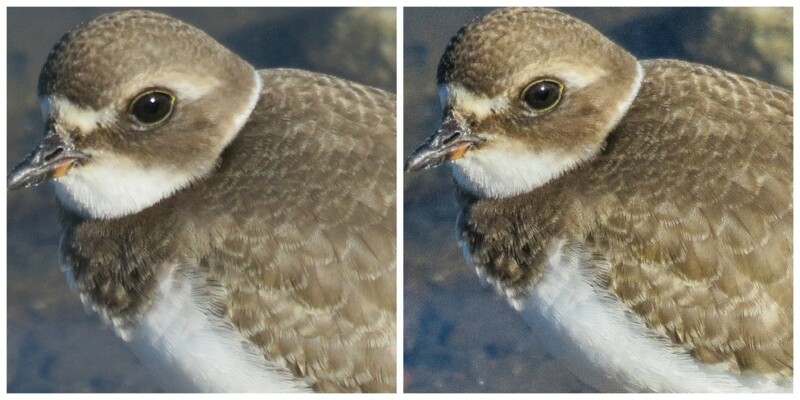 The Canon images from the SX series have always been very clean at the pixel level…showing very few digital artifacts (pixelization and blocking), noticeably fewer than the the Sony, but at sizes up to 2:1 magnification, both the SX50HS and the HX400V clearly show finer detail and less digital “smudging” than the SX60HS. Digital smudging used to be a huge issue in Sony P&S superzooms. 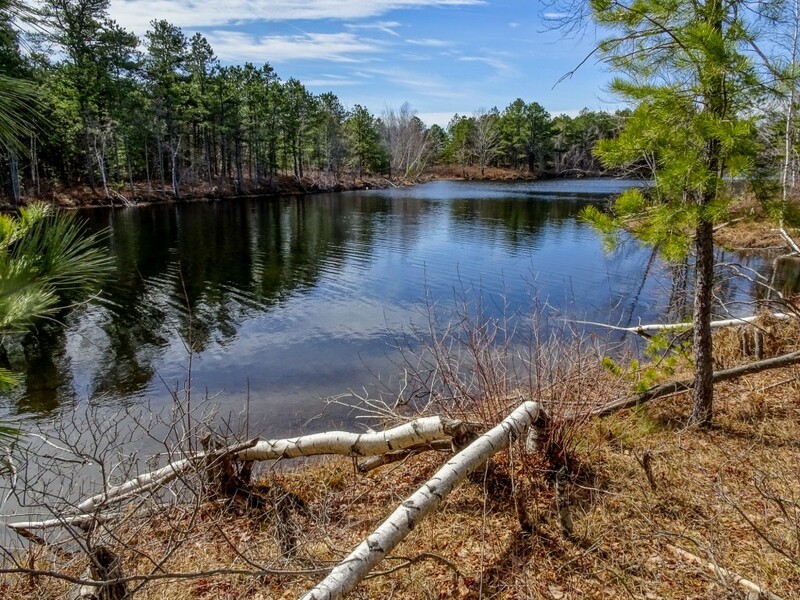 The fine details in browns, tans, flesh color, and all shades of green would just turn to mush, as though someone had dragged a wet brush across a water color painting. In fact, it was often called the water color effect. The Sony HX400V shows very little smudging and the SX50HS shows practically none. The SX60HS, again, straight out of the camera, shows a lot…as much as or more than earlier Sony H series cameras. Even without the smudging, the detail is just somewhat soft overall in the SX60HS when compared to the SX50HS or HX400V. SX60HS at full zoom. Center crop. HX400V at full zoom. Center crop. To compound the matter the SX60HS images at full wide angle and full telephoto zoom appear the most soft…and this time I think it is a lens or focus issue. Interestingly the images at full zoom look fine in the wonderful high resolution EVF, but as soon as you press the shutter release all the way down, you can see the image go soft even in the EVF. ??? And once up on the computer at home, the softness is evident, especially when compared directly to SX50HS and HX400V images taken in the same spot of the same subjects. It is, of course possible to process the SX60HS images after the fact to improve apparent sharpness and detail at screen resolution. One of the differences between Canon and Sony is that Sony always applies more aggressive in-camera processing to their jpegs. Some people feel this gives Sony images a painterly look, lacking subtly, but there is no doubt in my mind that the images have eye-appeal at normal viewing sizes. I have experimented with more aggressive processing for the SX60HS images in Lightroom, but honestly, there is only so much you can do without introducing so much noise that it becomes noticeable even at screen resolution. And I have also been experimenting with turning down the in-camera sharpening on the Sony. SX60HS, Unprocessed left, processed in Lightroom on right. HX400V. Sharpening turned down one. Processed in Lightroom. Post-processing to the rescue is not a motto I believe in. I want a camera that has excellent, or at lease acceptable, Image Quality straight out of the camera, so that I can make it even better in post-processing. The SX50HS and the Sony HX400V give me that. The SX60HS, at least in my early sample, does not! It is not a camera I could trust in the field on a day to day basis. HX400V left, SX60HS right. In-camera HDR processed in Lightroom. One mode where the HX400V clearly outperforms the SX60HS is in-camera HDR (High Dynamic Range. The camera combines three exposures taken automatically at different exposures to produce a single image with better highlights and shadows than any normal exposure). The Sony allows much more control over the process, and produces consistently better results, especially when shooting without a tripod. I find the SX60HS HDR images to be mushy and messy compared to the highly detailed HX400V images. If HDR is important to you, you might not be happy with the SX60HS. And then too, for whatever mysterious reason, the SX60HS totally lacks a Panorama mode???? What’s up with that? And I am sorry, the Wi-fi connectivity to a computer in the SX60HS is simply too difficult to set up. It to me three days to work it out, and I am considerably computer handy. Good luck to anyone who is not. The process is unnecessarily complex, involving several trips to the Control Panel, adding devices, installing drivers, etc. Once connected the Canon Camera Window software works well. Connection to an Android tablet is somewhat easier and again, the Camera Window software works. Still, the Sony was much easier to set up. And, for another omission that is hard to understand…the SX60HS has no GPS for tagging images. So, you would probably not upgrade to the Canon SX60HS because of the modern features, or for image quality, as such. Though the modern features are all there (except sweep panorama and GPS), they simply are not particularly well implemented. And the SX50HS still has marginally better image quality…though the SX60HS might show slightly finer detail (as others have reported from their own samples). You still might what to upgrade to the SX60HS for the very fine EVF and LCD, longer zoom, the amazing macro mode, and the continuous shooting ability, if those are more important to you than image quality. If you are choosing your first P&S superzoom for nature photography, the SX50HS is still available and is an excellent P&S for nature photography…especially if you do not need or want the modern features. 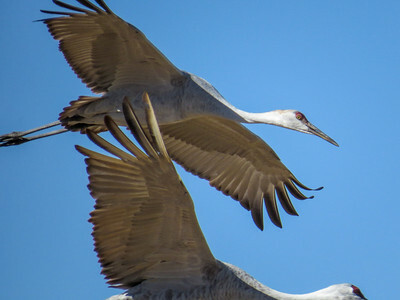 The Nikon P600 gets very good reviews and I have seen some excellent images from it. I would love to be able to test the Fuji S1, which looks like it might be worthy camera. If post-processing is already part of your work-flow and style, you are not adverse to a little extra work, you shoot much macro or active wildlife, and want the best EVF in a P&S, then the SX60HS has a lot to recommend it…but only if you can live with its lower image quality. The Sony HX400V, of the three cameras compared here, gives you the highest level of control over how your image is processed in the camera, delivers great images straight out of the camera, and has all the modern features (and well implemented at that). Despite its somewhat awkward continuous mode, I can highly recommend it. As I have said, my SX60HS is an early production sample. Things may change for the better when they get production ramped up. Mine is going back to Canon, and I will be shooting with the HX400V, with some additional tweaks I have developed during this test. I may reorder the SX60HS after a few months and give it another try. If I do, and it performs better, I will certainly let you know. What follows is a somewhat detailed comparison of the features and characteristics of the three cameras…at least the features and characteristics that I think are important for Point and Shoot nature photography. That I think! For instance, you will not find mention of RAW capability, since I don’t use it. You will not find mention of “face mode” or “creative filters”, since again, I have not found a use for them in nature photography. SX50HS: excellent, very clean overall, with good detail and color. SX60HS: perhaps acceptable, but requires considerable post-processing. Perhaps more subtle than the Sony. HX400V: excellent. More digital artifacts than the SX50HS or SX60HS, but very little to no detail smudging, great fine detail rendition, and vibrant colors. Not as subtle as the Canons. At the pixel level, the SX50HS looks best…for general viewing sizes I would give a slight edge to the HX400V. Some find the SX50HS images more natural looking. I tend to prefer the look of the more vibrant and apparently more detailed Sony images. At this point, unless Canon has a major firmware update that addresses the IQ issues, it is simply not in the IQ race at all. SX50HS: 50x, 24mm-1200mm equivalent field of view. The built in Digital Tel-converters at 1.5 and 2x provide acceptable results (especially for tel-macro where detail floods the sensor) out to 1800 and 2400mm equivalent. DTC can be applied anywhere in the zoom range, and is actually useful in macros to give large scale at reasonable working distances. SX60HS: 65x, 21-1365mm equivalent. The Digital Tel-Converters here are 1.6x and 2x, but, since base IQ is less, they do not produce as satisfying results. HX400V: 50x, 24mm-1200mm equivalent. Clear Image Zoom extends the range at the long end of the zoom out to 2400mm and provides very good results. Though the Sony is the fastest (brightest) lens, it is not by much. None of these cameras are low-light specialists. Still they are adequate for most outdoor work, and all have special digital trickery built in to handle low light and indoor settings. And honestly, where are you going to find a faster 1200-1365mm lens for any camera? f6.3-f6.5 at those focal lengths is actually pretty fast, especially considering the light efficiency of the small P&S sensors. SX50HS: quite fast, and quite positive. Seeks in low light and sometimes does not find focus. Seeks in macro, and sometimes focuses on background. SX60HS: as fast as the SX50HS, but not, perhaps, as accurate. Lots of shots are just a little off. More testing is needed. HX400V: fast and accurate. Some seeking in low light and macro, but the hybrid focus (auto with manual assist using the excellent fly by wire collar on the lens) makes it easy to acquire correct focus in even the most difficult situations. Both Canons also have a manual focus mode, but it is so difficult to use that it is pretty much useless. SX50HS: great! Allows for sharp shots, handheld, at full telephoto and even using the digital tel-converter…as well as in low light. HX400V: excellent, even better than the SX50HS, especially while framing the shot at full telephoto. I have total confidence in the IS on the Sony HX400V. There is no situation where I feel a tripod is needed. SX50HS: focus to 0 in. at 24mm equivalent. Goes immediately to 1.1 in. as soon as you touch the zoom lever, and stays there until about 35mm equivalent. Goes to 1.9 in. until you reach 100mm, then jumps to 11.8 inches. You can only focus to 19.6 inches below 200mm where it jumps to 27 inches to Infinity. It quickly goes to 3.2 ft., 4.5 ft., 6.5ft. It drops back to 4.9 ft. at about 1000mm, and reaches 4.2 ft. again at 1200mm. SX60HS: focus to 0 in. at 21mm equivalent. Jump immediately to 1.1 to 19.6 in. but stays there until you reach 200mm equivalent, where it goes to 3.9 in. At just beyond 300mm equivalent it jumps to 27 in. to infinity. From there it increases steadily to 6.2 feet just short of 1200mm and then drops back to 5.9 ft. at full zoom. HX400V: focus to .4 in at 24mm equivalent. 1.2 in. at 50mm, 2 in. at 85mm, 6 in. at 135mm, 11.4 in. at 200mm, 27.6 in. at 400mm, 5.2 ft. at 600mm and 7.9 ft. at full zoom. As you can clearly see, if you are into macro, the SX60HS is a great camera. Macros flood the sensor with detail, and you will get amazing results from 1.1 inches at 200mm equivalent field of view. The tel-macros on the SX50HS from 4.2 feet at 1200mm (or even 1800mm using the DTC) are totally amazing. The Sony makes up somewhat for lacking a true tel-macro with its higher pixel count and good IQ, both of which allow for pretty heavy cropping when you need it. On the other hand, the macros from 2 inches at 85mm are simply stunning! SX50HS: 13 fps in dedicated High Speed mode for 10 shots. 3+ frames per second in regular continuous mode, with focus locked on the first frame, up to 24 shots. Less than 1 fps with focus between frames. Sports mode seems to break the rules and gives something over 3 fps with focus between frames, bot only in Standard resolution (not Fine). SX60HS: as above, 6.4 fps continuous until the buffer fills, then progressively slower. Focus locked on first shot. Slower in low light. Moving the camera (as in panning to follow a moving subject) seems to fill the buffer faster. The finders is refreshed after each shot, beginning with about the 3rd shot, so you can see what you are following. 3.4 fps is set to focus between frames. There is evidently a third mode at 4.3 fps (LV: but I have not found what LV means in the manual yet). HX400V: High speed: 10 fps for 10 frames. One press of the shutter shoots all 10 frames. Low: 2 fps. It is difficult to shoot less than 3 frames. The camera focuses between frames and the viewfinder is refreshed. However all shots are held in a buffer, then displayed to the LCD or finder as a group, then written to the card. It takes a few seconds between bursts for the buffer to clear. Sports mode on the Sony does not break any rules, and you are limited to the Low setting for continuous shooting. In practice, I find that 13 fps, or 10, is simply too fast. You end up with 10 essentially identical images, and since focus locks on the first frame, if the first one is out of focus, they all are. 🙁 2-3 fps is fine for most bird and wildlife action, and focus between frames is essential. Of course. your needs may differ. All in all, the SX60HS is pretty clearly the winner here. SX60HS: quite good. Higher resolution and contrast than either of the others. Colors a bit off, well on the warm side, but a real pleasure to use. HX400V: adequate (but just). I have slightly more difficulty with this EVF in critical situations (like finding a bird in a bush or tree) than I do with the SX50HS. For wildlife photography, a good EVF is essential. None of these match the EVF on the Olympus Mirrorless Compact DSLRs, but they get the job done. And the EVF on the SX60HS comes very close to the Mirrorless standard. All three are sharp and bright enough for daylight use. The SX60HS is the brightest and sharpest. SX50 and 60HS: fully articulated, swings out and around to the side and rotates 180 degrees. HX400V: semi-articulated. Pulls out and rotates about 90 degrees, 45 up and 45 down. For me an articulated LCD is essential for macro and low angle landscape work. Both designs work here, but the Canon design is superior. 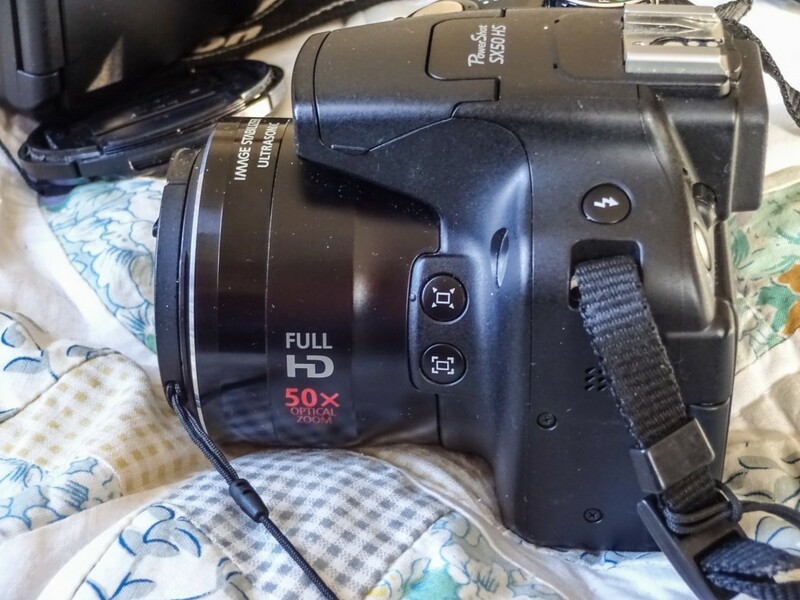 SX50HS: I have used this camera for two years so I am well used to where things are. There is a button for almost everything you might want quick access to, and one programmable custom button that you can reach with your left thumb. The controls are large enough for average hands. The thumb wheel surrounding the 5 way rocker control on the back of the camera can be awkward but is usable. SX60HS: The 5 way rocker control on the back is very difficult to use without looking and the rockers are very small and too flush with the surface for my fingers. I may get used to it, but it is awkward. There is no ISO control button and the exposure compensation button has been moved off the rockers to a separate button above and to the left. The programmable shortcut button has been moved to the top where it is reached by your shutter finger. The thumb wheel has been moved from surrounding the 5 way rocker to an actual wheel immediately behind the shutter release. This means that you can NOT operate it with your finger on the shutter release as it requires that finger to turn it. Awkward! On the other hand, it is very handy for changing the primary settings in each Mode. For instance in Shutter Preferred Mode it controls shutter speed. Canon missed, in my opinion two good options for this wheel in standard Program mode. It ought to either control manual focus (ideally a manual focus assist for Auto), or Program Shift. HX400V: Controls are well placed and large enough for most fingers. The rocker buttons on the 5 way control have a raised edge and are very easy to use. There is one programmable custom button immediately behind the shutter release and a function button to the left of it. The function button pulls up a programmable on-screen menu of the most used settings for the mode you are in. Selections are made using the center button on the 5 way rocker and adjustments are made using the excellent thumb wheel, which is ideally placed under your right thumb. (It is possible to turn this wheel unintentionally while handling the camera, but a little care solves the problem). All in all, excellent controls and layout. The one thing all these cameras lack is touch screen control. This is surprising in cameras at this price level. An intelligent touch screen would improve usability. SX50HS: three exposures, adjustable for exposure spread and center, with “creative filters” (oops, I made a lair of myself…but I don’t use them). The three exposures take significant time, so a tripod is absolutely necessary. Results are good if you set it up right. Any movement at all results in ghosting or misaligned images. SX60HS: three exposures, not adjustable, with creative filters. Results: not so great. The range is extended, but all fine detail is lost, and detail over all is smudged. Useless. I find in-camera HDR to be a big help with dramatic landscapes…big skies, etc. Of these three, only the Sony has a really effective in-camera HDR mode, and it produces files that can be easily tweaked in Lightroom for natural look I prefer. Post. SX50HS: Stitch assist panorama in any direction. Display allows you to overlap three or more separate exposures or stitching later in software. HX400V: two different (wide and standard) sweep panorama modes. Images are created seamlessly as you sweep the camera across the scene in any direction, in either portrait or landscape orientation. Such fun! And don’t forget to try vertical panoramas with the camera sweeping down. Post. Considering that Sweep Panorama is built into $200 Point & Shoots these days (phones even), it is, in my opinion, inexcusable that Canon did not implement it in the SX60HS. Sony was the first to implement sweep panorama in a P&S, and their mode is still the best! If you shoot birds or bugs in flight, you are going to be interested in the Sports Mode on these cameras. Sports Mode is optimized for rapidly moving subjects. SX50HS: excellent. Locks on to moving subjects and tracks them, even after the shutter is pressed. Follow focus as long as the subject is near the center of the finder. Only focuses to 49 feet at the long end of the zoom, closer in at below 600mm. About 4 fps. HX400V: large center focus rectangle picks up whatever is moving closest to center and tracks focus. 2 fps or 10 fps. Both the SX50HS and SX60HS shoot in both RAW and jpeg, or RAW and jpeg. That gives you a lot of control over how the image is processed after the fact. The Sony only shoots in jpeg, but gives you a lot of control over how the image is processed in camera. The Sony Creative Styles, as noted above under HDR, provide 7 different processing programs, each of which can be individually adjusted for Contrast, Saturation, and Sharpness. Your adjustment are remembered so in Program, you can have 7 individually tailored processing options. Changing Creative Style on the fly is easy, using the function button for quick access. You can also set a customized Creative Style in both of the Memory Modes. I am just beginning to play with customizing my Creative Styles, but I believe that this kind of control in-camera makes not having RAW much less of an issue. To finish, I will give you my likes and dislikes for the Canon SX60HS and the Sony HX400V. auto focus with manual assist using focusing collar on lens! Auto is your (Smart) friend. 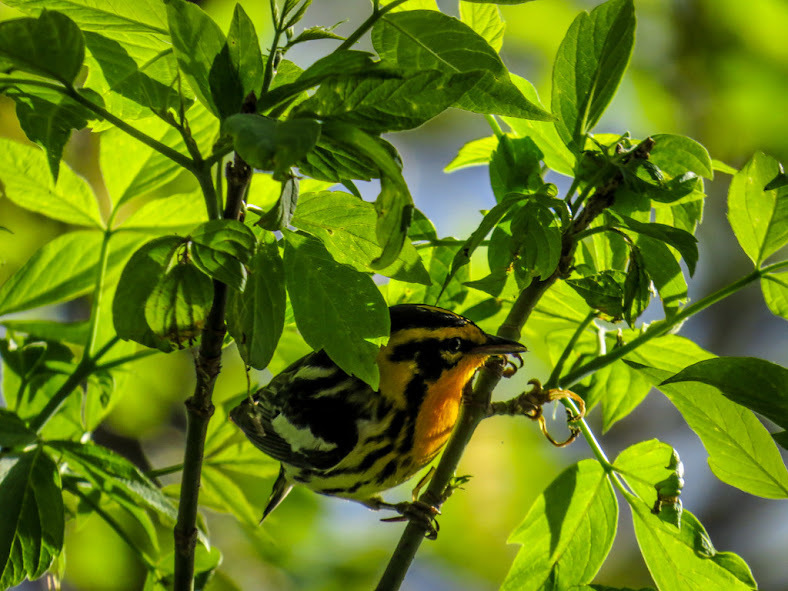 Blackburnian Warbler, Magee Marsh, OH. Canon SX50HS. Program with a slight tweak. Exposure is the art of controlling the amount of light that reaches the film or sensor in a camera, so that you get a natural looking image of the scene in front of the lens…with a full range of lights and darks, and colors in a pleasing balance. Not too light, with no detail or texture in the washed out whites and bright colors in the scene…and not to dark, with inky black shadows and dingy grays instead of white, and muddy, unsatisfying colors overall. It is more difficult that it sounds because no recording medium, neither film in the old days, or the light sensors in today’s digital cameras, can actually capture the full range of light and color that the human eye sees. There is always a compromise…a set of choices that have to be made…so that you can compress the scene before you into, today, a digital file which can then be reconstituted to present an image…whether it is printed, or displayed on an LCD panel…that comes close to what you saw at the time you pressed the shutter. Tricky business. And, until recently, getting the exposure right was way more than half the art of photography. When I started seriously taking pictures with slide film SLRs, if more than 1/3 of your images were pleasingly exposed, you were doing very well indeed. It is far different today. Today we expect 90% of our images from any outing to be correctly exposed. Even if we use full Auto! Back in the day, no serious photographer would have been caught dead using Auto exposure. Auto was a crude thing, a matter of averages and a limited number of brightness steps, that, at its best, only produced an approximation of correct exposure, and that only rarely…maybe one in ten images. Putting your camera on auto all but guaranteed that the number of satisfying images you took would be very limited. After all, what camera meter and electronic circuit could ever hope to match the experience and skill of the human eye and brain? Only rank amateurs…and those too lazy to learn a little photography for pete’s sake…used Auto. Almost all Point & Shoot cameras today have some sort of smart auto system. Different makes might call it different things, but Smart Auto reads the information from the sensor, does a first level mathematical analysis to see which of up to 20 different scene types it most closely matches, applies the exposure settings from the chosen Smart mode, and then, based on a second analysis of the sensor data which looks for anomalies, fine tunes the exposure for the individual scene. In essence the camera does automatically, and all but instantly, what the photographer would do if he or she were determining exposure manually. Exposure is more art than science, in that the choices you make, if your are making them yourself, are based on your experience with light and shadow, form and texture…your memory of similar scenes…and your experience of how your particular camera responds to light and shadow. When confronted with a scene, you mentally access your own experiences, and pick the settings that have worked in the past for you in similar scenes, then, based on a closer analysis, generally involving metering or at least consideration of particular tonal problems of this particular scene, you tweak the setting in a way you hope will improve the exposure. 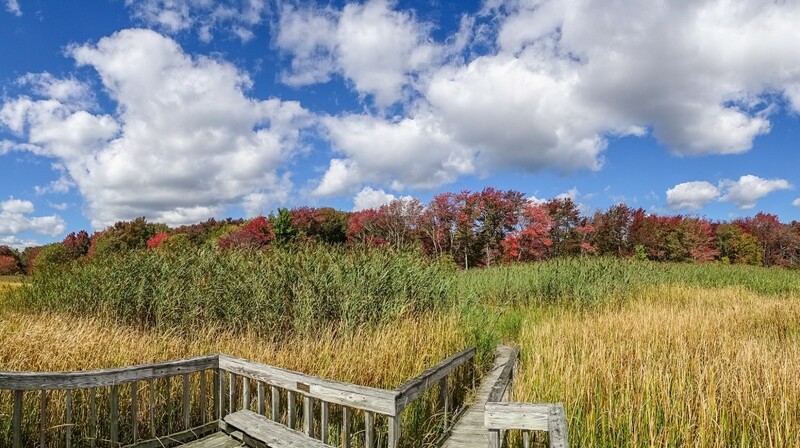 A full range image using the camera’s Rich Tone (HDR) mode. Yes, like I said, that is exactly what Smart Auto does in the Point & Shoot camera. Only, instead of drawing on just your experience of light and shadow, form and texture, and your limited experience with how the camera responds, the engineer/artists who design the exposure system draw on a mathematical analysis of of thousands of scenes and direct knowledge of how the camera sensor responds to light. It is still art, or at least more art than science. The engineers who design the system still have program it to make choices that produce what are, to their eyes, pleasing results when the image is finally displayed as a print or on an LCD screen. Choices. Artistic choices. And, to be honest, some camera makers, to my eye, are better at this than others. They all manage correctly exposed images 90% of the time…it is just that some cameras consistently produce images that are pleasing to my eye…that approach most closely the way I remember the scene, or the way I want to remember the scene. And some camera makers don’t. Anyway. What all this means is that there should be absolutely no shame involved, no matter your level of photographic experience or skill, in putting your Point & Shoot camera on Smart Auto and just going out and taking pictures. Certainly, as a beginner, that is should be your setting of choice. You will have to take a lot of images before you even begin to learn where Smart Auto is letting you down, and, when you eventually do (and you will)…well that is plenty of time to begin learning what to do about your, or the camera’s, failures. In the meantime, take a lot of pictures. Don’t share the ones that don’t satisfy you, but save them to study when you get to the point where you want to learn a little photography, for pete’s, and your own, sake. Posted on September 18, 2014 Categories UncategorizedLeave a comment on Auto is your (Smart) friend. 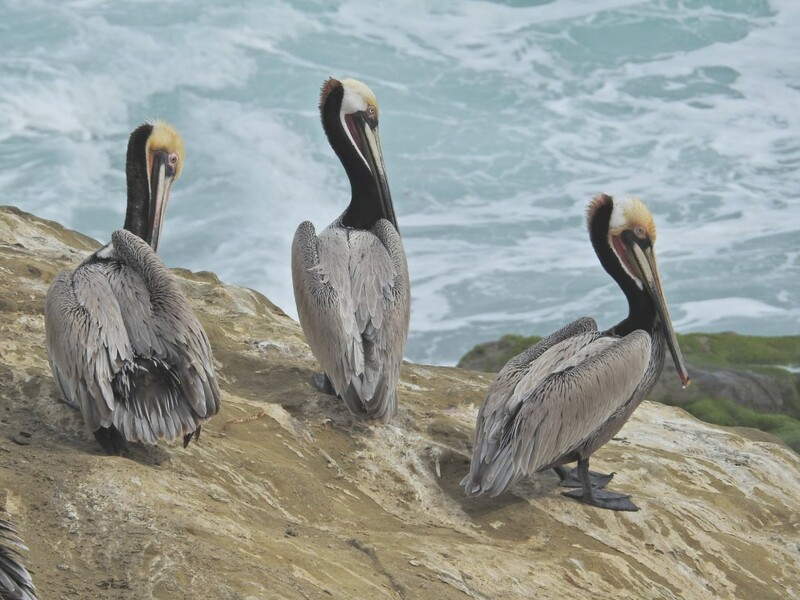 I was a photographer before I was a birder. I watched (photographed) wild-flowers, and mushrooms, and the play of light across the landscape before I ever seriously looked at birds. Oh I had tried photographing birds and butterflies, but this was back in the days of film…and photographing anything that moved was 1) expensive, since you had to pay for every missed shot, and 2) frustrating without very expensive equipment. I never had much luck with the film or the gear I could afford. 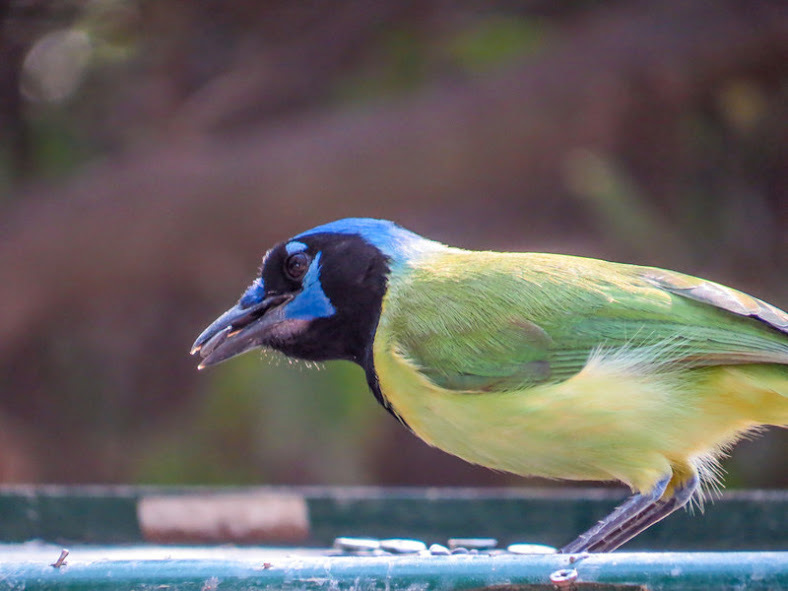 And then, one day on an unfruitful wild flower trip to southern Arizona (too hot, too dry), I began to look at birds. I soon invested in good binoculars (which I could just barely afford) and a good field guide. Then I invested several years in learning to bird. It was a lot of fun, and very satisfying. I am, in fact, over 20 years later, still learning 🙂 and it is still both fun and satisfying. Along the way there, the digital photography revolution happened. I was an early adopter of Point and Shoot digital cameras. I bought my first one when they came down under $500. It was a 2 megapixel Olympus with a 1-3x zoom, and I loved it. I found that I could photograph everything that I had in my film days, when I carried a full SLR kit…2 bodies and an assortment of lenses…with this little, not-quite-but-almost-pocket-able digital camera…and I found that I took way more images, considering that I was not paying for the missed shots! And that 1-3 zoom was light-years ahead of the 1-3x zooms I had owned at the end of my SLR carrier. Since then, I have steadily upgraded my cameras as the cameras themselves developed…always sticking with Point and Shoots. The DSLRS don’t tempt me. I have become addicted to small, light-weight, and super flexible. Over the past few generations of digital, I have come to appreciate the clever “modes” that have become the norm in Point and Shoots since CMOS sensors have replaced CCDs: everything from dedicated macro to night-shot, to in-camera HDR, and sweep panorama. And the zoom range has steadily grown. I am using a Point and Shoot with a 50x zoom these days. It has the fields of view of everything from a 24mm wide angle to a 1200mm super telephoto (up to 2400mm with the built in digital tel-converter)…all in one compact camera and lens. It does not fit in my pocket, but it is way lighter and more compact than any DSLR, and there is, in fact, no DSLR lens made that will reach 1200mm, let alone 2400mm. 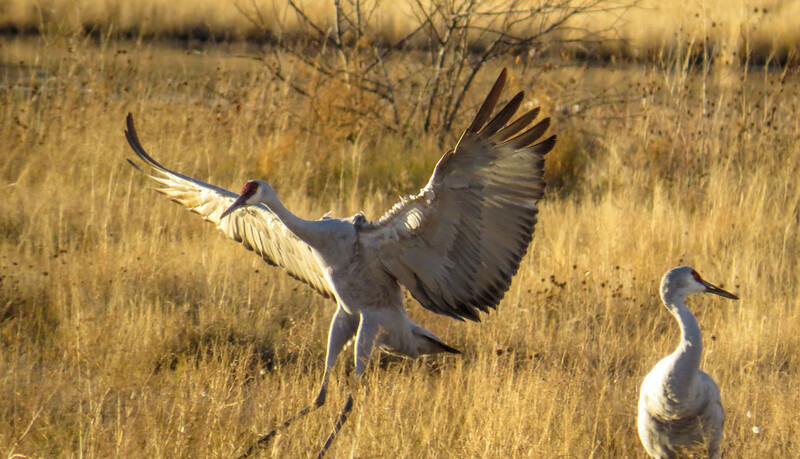 My 50x digital point and shoot also has continuous shooting at 3 frames per second, and a sports mode that makes shots of birds in flight not only possible, but fairly easy. It will shoot macros with the subject touching the lens at wide angle, and focuses to 5 feet even at 2400mm equivalent. It is a truly amazing camera. About 3 years ago I got seriously interested in dragonflies. I am now learning my odonata. 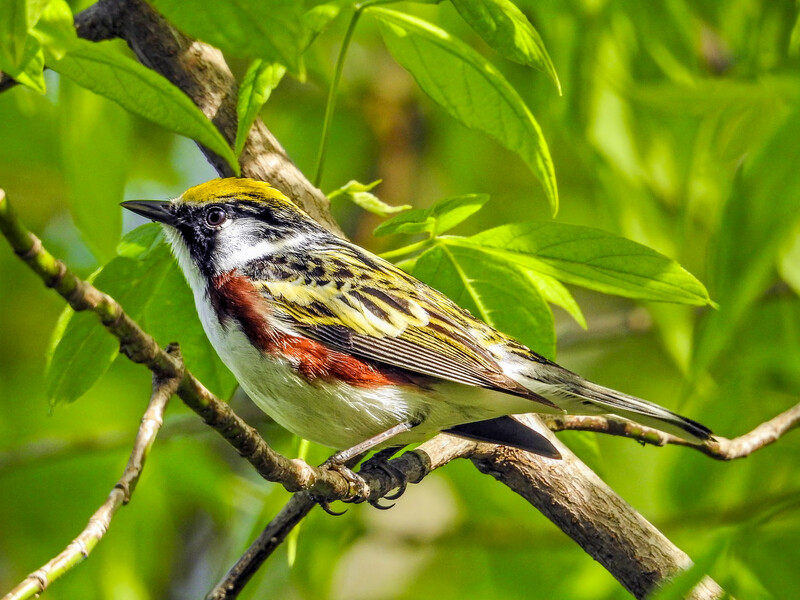 I am not however, like some students, netting them…nor am I studying them through binoculars as I did my birds. 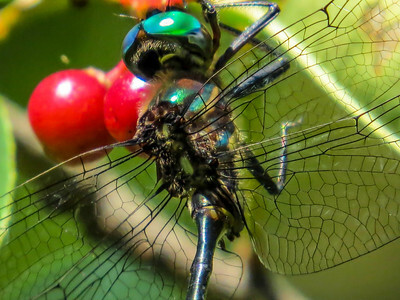 The key for me was finding that I could photograph them with my long-zoom point and shoots, and then bring the images home for study and comparison to field guides…and, even better…to the great wealth of odonata resources on the web. (You have not seen a dragonfly image until you have seen one taken at 2400mm equivalent from 5 feet.) 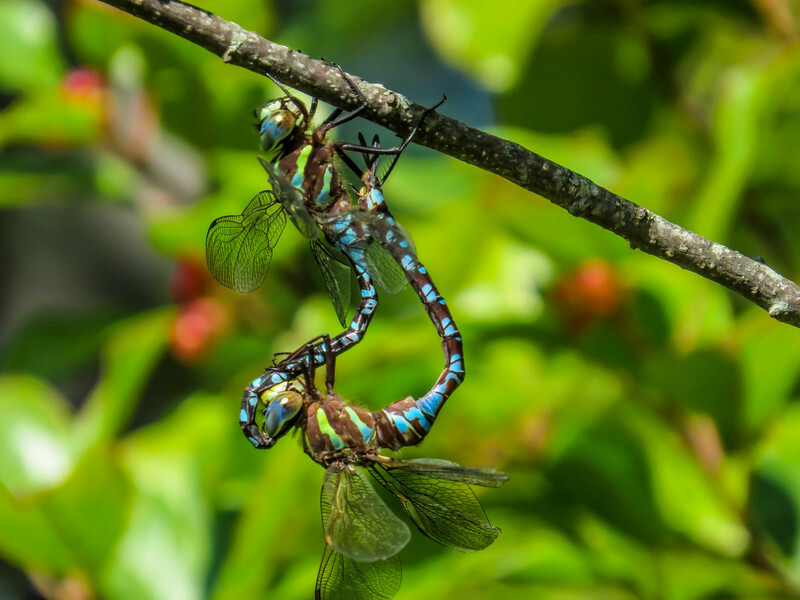 I joined a couple of on-line groups of like minded students of odonata, and I draw on the expertise of the whole odonata community as I need it (which is still very often). And I am learning. Most of the bugs I have photographed and identified from images, I can now identify by sight when I see them in the field…many of them even on the wing. I have learned as much about odonata in 3 years, as I did in 10 as a beginning birder. And leads me to think that, had inexpensive digital point and shoot cameras been available when I started to learn to bird, I might never had bought binoculars. I love books, and I probably would have bought birding field guides just as I have bought odonata guides…but it was years before I had the support network of fellow birders that I already, almost instantly, have for odonata. The world has changed, and, from my own experience, and my observations in the field over the past few years, I am pretty sure the way people are learning to appreciate nature…birds, bugs, wild flowers, and the play of light across the landscape…is changing too. And why not? You can now buy a capable camera for much less than capable binoculars. 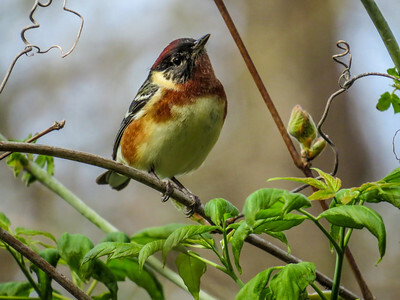 You can now develop a circle of birders, or buggers, or wild flowerers, in a fraction of the time it took a few years ago…and your circle, unlike the location-bound circles of the past, will very likely contain some of the best minds and eyes in the community…even the worldwide community. No, if I were learning to bird (or bug, or wild flower, or watch wildlife) today, I would probably start with a camera in hand, and the internet on tap. And, when you stop and think about it, this new way of learning to appreciate nature has the potential to attract exactly who we need to attract…if birding, bugging, wild flowering…in fact, if nature itself is to survive beyond the lifetime of our children. It is just techy enough and social enough (in the internet meaning of the term), and maybe even just cool enough to appeal to the gaming and social networking crowd that is coming up behind us old folks. This, I am pretty sure, is a good thing. And that, folks, is the theory behind the Point & Shoot Naturalist. I intend to explore this possibilities of this new way of leaning, and celebrate the learning here. Oh, we will probably discover the limitations of Point & Shoot Naturalism as well, but my feeling is that, on balance, learning to appreciate nature with a camera in hand is a pretty good idea…and may open nature to a whole new generation of naturalists, and maybe even to some of my own generation who might not other wise have ever taken an interest.